Directions: After cleansing your skin with NISIM Clinical Strength Body Wash and towel drying your body, apply a liberal amount of NISIM Clinical Strength Body Lotion. Using your fingers, massage all applied areas until the lotion disappears into your skin. Use daily for best results. This lotion can be used several times a day for even better results. Caution: Do not use on areas of the body that have open sores. Best results are seen if used in conjunction with Dermylex Supplements. I always get dry skin whenever I visit a new place with a different humidity level. I do use other lotions in the market, but it takes so long to work. 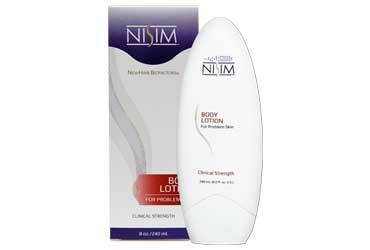 Then my Aunt recommended using the Nisim Body lotion. She said she has been using it and it worked great for her. True enough, after a few days of using it, the dryness in my hands was cured. Highly recommended product. My daughter and myself struggle with terrible eczema on our faces, arms, and legs. We have tried numerous different products to cure the terrible problem to no avail. We recently tried the Nisim Clinical Strength Body Lotion and are seeing excellent results! It is such a relief to be able to wear shorts or a sleeveless shirt without having to worry about unsightly bumps and redness. We use it daily and see clearer skin with each and every use. I am very pleased with this product, and I am so glad we found Nisim. My mum bought me this produce as I get dry skin on my back (and always have had similiar products as I used to have eczema as a child). Leaves you feeling smooth with no itching or dryness, I have used this for about 2 weeks now and the effects were fast. Now I brought this because I got tired of using all the other products out there that didn't really make a difference. So when I used it I thought it would be like the rest but to my astonishment within 5 days of using this the dryness of my skin started to disappear. I suffer from eczema which doesn't help but this lotion did exactly what was written about it. All though it doesn't cure the dryness for good it does a fantastic job of keeping the dryness at bay as long as I use it. Thanks for producing such a good quality product and not just a lotion that doesn't do what it's supposed to. When I first heard about the clinical strength lotion from my cousin, I was a little sceptical. He claimed it worked just as good if not better than the name brands, such as Suave or Dove . So he gave me a small bottle to try... and I have been using it ever since. My personal opinion is that it keeps my skin moisturized and smooth longer than Suave or Dove. I work out in the cold so it keeps my hands from getting dry. I have been telling everyone I know about it . I plan on buying some of their other products in the future.